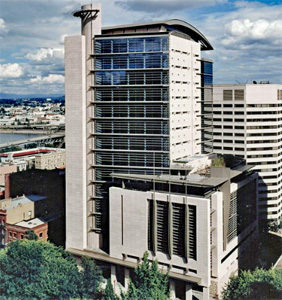 The Mental Health Alliance was formed in 2018 to join the continuing Federal lawsuit, United States v. City of Portland as an amicus curie – or “friend of the court”. Three organizations which represent the interests of people with mental illness and have long participated in efforts to reduce police use of force used against people with mental illness – Cascadia Behavioral Healthcare, Disability Rights Oregon, and the Mental Health Association of Portland, joined together to form the Alliance. In 2014 the US Department of Justice issued a finding statement saying the Portland Police Bureau had a “pattern and practice” of using too much force with people with mental illness. In response to United States v. City of Portland, the defendant city offered a lengthy settlement agreement to the DOJ. Judge Michael Simon convened a hearing to ask about the fairness of the settlement. Is it reasonable? Is it adequate? Is it fair? Finding the agreement reasonable, adequate and fair, he continues to hold regular semi-annual status hearings where the parties, amicus curie, and the public can speak to whether the settlement remains reasonable, adequate and fair. Amicus curie is a latin term used in American and English law to identify an impartial adviser, often both voluntary and selected by the judge, to a court of law in a particular case. Cascadia Behavioral Healthcare delivers whole health care – integrated mental health and addiction services, primary care, and housing – to support the Portland community, provide hope and improve well-being for those they serve. Disability Rights Oregon is a nonprofit that works to transform systems, policies, and practices to give more people the opportunity to reach their full potential. DRO serves as Oregon’s federally-mandated Protection & Advocacy service, and their attorneys have represented people with mental illness as individuals in court, in class action suits, and in investigative advocacy. Mental Health Association of Portland provides impartial and independent advocacy for persons with mental illness and addiction. This peer-driven organization maintains advisory councils and committees for individual educational and advocacy projects. One other organization joined United States v. City of Portland as an “enhanced” amicus curie in 2015. They are the Albinia Ministerial Alliance Coalition for Peace and Justice Reform. The Portland Police Association also joined in 2015 as a defendant-intervenor.